Guyana, once considered a frontier country, is now emerging as a highly attractive area for resource discovery. This English-speaking nation located in South America, with an established rule of law and stable economy, has long been known for the endowment of gold. Nonetheless, the expansive interior was remote and therefore did not see the intensity of historical exploration work in proportion to many other countries. The times are changing and Guyana Goldstrike Inc (TSXV: GYA – $0.30 & OTCBB: GYNAF – $0.23 & Fra: 1ZT – €0.22) has secured control of a highly prospective project in Guyana that could evolve into a significant multi-deposit gold district. The Marudi Gold project is an exploration asset with several deposit areas outlined and an established gold resource with an estimated 259,100 ounces of gold (Indicated) and a further 86,200 ounces inferred. The NI43-101 compliant resource estimate was prepared in 2018 for the Mazoa Hill deposit area. Several other gold deposits and showings have been outlined from prospecting, sampling, and historic drilling work in various sections of the property. Three distinct gold deposit types have been encountered within the property area, including higher grade hard rock mineralization, a disseminated gold-in-saprolite horizon, and alluvial gold deposits in stream beds. Despite an extensive database of exploration results from previous operators of the project, and the abundant gold-bearing zones that have already been outlined, less than five percent of the property area has been tested with systematic exploration programs. Consequently, the project is considered to have excellent potential for additional gold discovery. This potential has been validated by a series of trenches that were recently completed by Guyana Goldstrike during the first phase of its 2018 exploration program. So far trenching work has been completed at a total of four distinct target areas. In May, the Company reported a new gold discovery at the Paunch target area, when the first assay results from trench samples were highlighted by a section bearing 7.45 g/t gold. 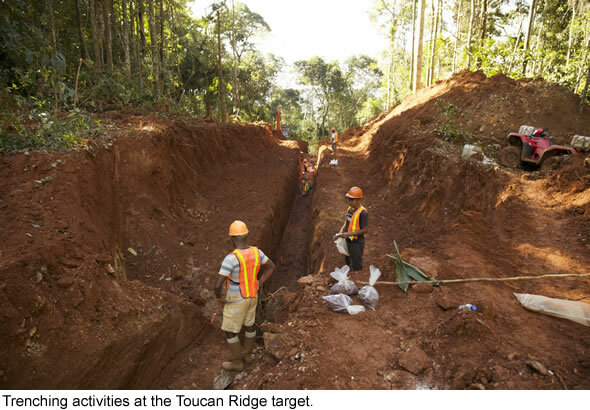 Following this positive start, another round of trenching commenced focusing on the Toucan Ridge target, located 400 meters to the south of the Paunch area, and roughly one kilometer to the north of the Mazoa Hill deposit. Toucan Ridge was identified based on historic soil sampling work but had not undergone further exploration prior to this year. A total of seven extensive trenches were excavated down 3 to 5 meters from surface. The project geologists were pleased to encounter the Quartzite-Metachert host rock elevations almost from surface in these trenches. This same rock unit has provided the setting for the higher grade gold-bearing alteration zones elsewhere on the property, but usually accessed at much deeper elevations through drilling work. A second positive surprise was reported in terms of the intervals of these surface zones, with trenches extending more than 100 meters in the target rock type. Given that the Toucan Ridge target has been mapped at surface for an area of roughly 1.75 kilometers along strike, and 300-400 meters in width, this zone amounts to a very large potential ‘footprint’ for a gold deposit. While there is not enough data to make estimates in terms of the resources for this new zone, the large potential mineralized area could certainly amount to a deposit of more than a million ounces of gold, if the grade is consistent with other zones outlined on the property. A third very promising development is the presence of coarse and visible gold particles reported from some of the sample areas in these trenches. Visible gold is relatively rare, even in very high grade gold systems. This does not provide immediate confirmation that the company is on track for a higher grade gold system, but it is certainly a positive indicator, and it definitely signifies a second new gold discovery is at hand on this large, prolific property. The first round of assays from Toucan Ridge were announced on August 2nd, including a 3m sample interval grading 1.14 g/t gold, plus a second section of 1.5 meters bearing 1.53 g/t gold. The company has opted for conventional fire assays to establish gold grade, and will also complete a round of testing using the total metallic content approach for some samples. The secondary testing will more accurately account for coarse gold values that have been observed in gold panning evaluation work for samples collected from some sections of the trenching. While the gold grades were of economic interest and within the average grade of the defined Mazoa Hill deposit, this promising report was for sample material from just one of the trenches. This week Guyana Goldstrike followed up with another update from Toucan Ridge. A total of 775 meters of trenching has now been completed, and over 300 samples extracted from them and submitted for assays. Additional work continues to advance along the ridge, with trenches driven approximately 50-100 meters apart, and perpendicular to the strike length along the ridge. Several batches of additional assay results are expected to be reported over the next few weeks from these exciting discovery areas. A second phase of exploration work is already in planning to follow up with drilling work. The Toucan Ridge zone has already been designated as a priority drill target, given that such extensive areas of the ideal host rock has been exposed near surface. The area of this target zone is compelling for the potential of a large new gold system and the prospect that quartzite-metachert alteration may extend to significant depths below. The Marudi Project has been advanced by several previous operators, with many years of work activity to enable an initial gold resource calculation and provide a head start of data. Now that Guyana Goldstrike has secured control of this highly prospective property, the objective is to aggressively move forward and complete thorough exploration that is warranted by the gold showings encountered so far. The combination of a talented exploration team, a well-funded treasury, and the commitment to step up and get busy in the field, can make all the difference between success and failure for a junior exploration company. This approach is already paying off, with the delivery of two new discovery zones from the first coordinated exploration work on behalf of the Company. The positive early signs, including the exceptional surface area outlined so far at Toucan Ridge, plus the presence of visible gold that has been encountered, suggest a significant emerging gold deposit area may be at hand. Guyana is typically affected by the ‘rainy season’ at this time of year and it has almost passed. Once the outlook for favorable weather is improved, Guyana Goldstrike plans to initiate an airborne geophysical program for the entire property area. This will help to further narrow down the exploration focus for the property, and potentially indicate new target areas where the geophysical signature shows similarities to established deposit zones. There is also the intriguing aspect that perhaps intervals between deposit zones may also demonstrate attractive signals and open the potential for a much larger super-deposit. Considering the historic data outlining abundant gold zones in several other areas of this property, and given that such a small part of the entire project has been tested at this stage of exploration, the potential going forward is attractive indeed. The expectation for several news releases to report assays from trenching work in the weeks ahead should continue to support the momentum for this story, and if the news continues to be favorable, this will further build the case for at least one large new gold deposit area awaiting discovery in the new zone. With the prospect of drilling to commence shortly, and the ideal geological setting with target host rock extending across a broad surface area, the speculative potential for Guyana Goldstrike is appealing. And this accelerated pace of exploration activity is underway just as the typical window of seasonal strength for junior exploration stocks is coming into play for the fall/winter months. Recommendation: BUY.